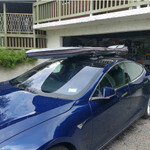 Roof Racks – The SeaSucker Roof Rack works on almost any car, they are width adjustable and can carry most loads up to freeway speed limits. Ski Racks – The perfect Ski Rack that works on almost any car. The SeaSucker Ski Rack uses lockable 61 cm carriers, can be installed in under 2 minutes and removed in seconds. Tablet & Smartphone Mounts – We have Tablet & Smartphone mounts that can be used both in the car and around the home. We also have Tablet & Smartphone Mounts purpose built for off-road and marine use. Storage Solutions – Need extra storage space? Do you hate drilling holes? Looking for a storage solution that is waterproof? Then SeaSucker has the answer..